Under the Crossing Mind moniker is Stéphane Bèze, from Nice, France. He’s been producing Goatrance for 15 years. He’s also well known for wreaking havoc on the dancefloors with his peculiar ipad-based setup. His performances at Connection or Boom Festival, to name a few, have been remarked. 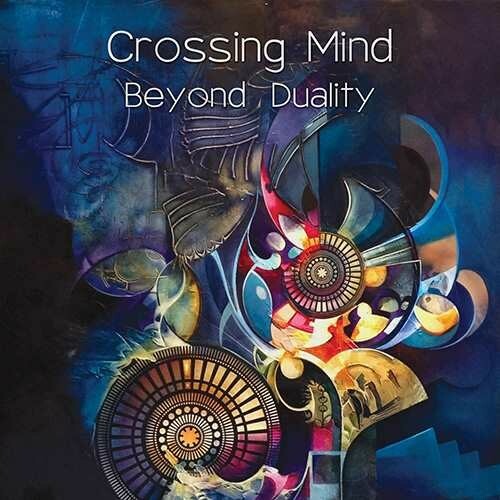 And after frenetic live-testing and refinements, his new jewels are now released in his third album “Beyond Duality”. “Cyclotron” borrows sweet new age influences but quickly evolves into a fresh melodic/panoramic track that perfectly lifts your spirits. Now be ready because “The Foolish Mind” immediately sends you to an asylum of melodies and crazy twisted climaxes talking to each other for nearly 11 minutes. “No Hazardous Materials Signs” keeps on raising the bar with its many layers flowing like manic spirals. If you survive this, you’ll have to face the final version of “Hypnotropic”, the track that blew so many people away in parties. A perfect stomper with incredibly devious twists and a massive drive! Speaking about drive, “Alpha Centauri” feels like an odyssey into space with a fantastic mix of technologic moments and warm analogic sequences reaching gorgeous peaks in psychedelia!!! Following up on this trend, “No Event Horizon” adds up to the space trip with majestic sci-fi images. You thought you were done but Crossing Mind had yet another stomper in store: “PsyKo-Mind-Porteur” slaps you in the face with an avalanche of exhilarating spiraling climaxes and a perfect Total-Eclipse-like ending. Finally “Life Forms” offers a gentle landing full of emotions. Crossing Mind manages to marry frenzy melodies with heart-warming feelings. And he sends you well beyond that duality up to new levels of psychedelia. Enjoy! This album is crystal-clear mastered by Tim Schuldt!